For the past few months we have been sailing up north, first to Lerwick Shetland and then up the Norwegian coast. We spent the month of June around the Lofoton islands around 68 degrees latitude enjoying 24 hour sunlight. We are now on the way back home currently waiting favourable winds in the Tronheimsieia strait. 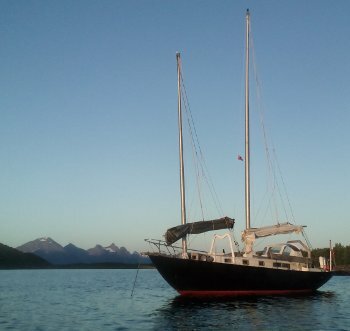 The rig has preformed well throughout our travels the only problems encountered is the main halyard. Our 10mm braided polyester has suffered extreme twisting and clinking often so bad it could no longer reeve through the blocks. 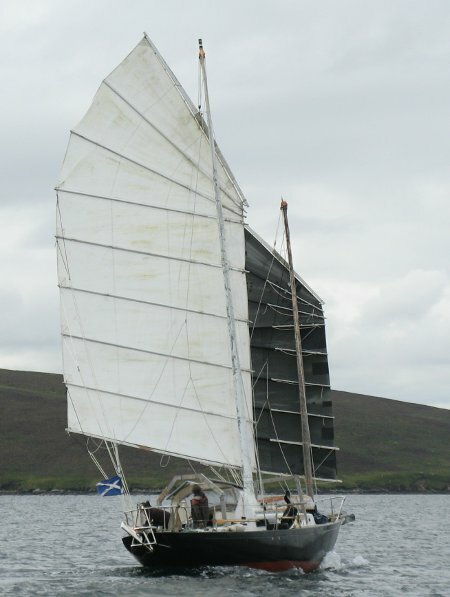 We changed it to a 3 part halyard in Lerwick with the the end tied to the sling plate to enable the halyard to be removed, untwisted, and re-rigged without having to go to the top of the mast. This helped to a degree but will in no time get twisted up yet again. 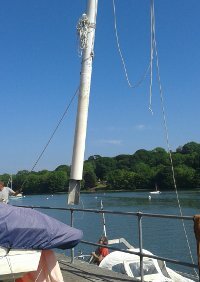 We switched the main halyard with main sheet, approximately the same length, but this too only provided temporary relief. We then spliced together some three strand and this has worked much better this past moth, although it too has a tendency to twist and kink. The three part 8mm braided foresail halyard has caused us no grief. This could be in part due to the smaller diameter and lighter loads. To those who may think that the twisting problems is due to the handling and storage of the halyard, I can state it is not. Much care is taken in de-kinking the line and stowing it every time it is used, yet the problem persists. The plan for the future is to get bigger blocks, and use new three strand with a 5 part halyard. This should allow the halyard to last longer due to less pressure on any part and allow longer before needing the line to last longer before needing replacement. On the bright side, the new fore gallows I built and installed this Spring is working as it should. There has not been a single case of fore sheets getting caught on the sides during slack gibes. I am considering building a similar shaped on for the main. Both sails are holding up well despite needing new patches over small holes and rips every week. I regret not stitching webbing on to foot of the sails now as there seems to be more stress and rips forming than I had anticipated. A modification for this winter. Another sail modification I am planning is to sow in end pockets for the battens on the leach. This should prevent the sheetlets getting caught behind the protruding batten ends of the leach. Lastly, we have removed the fan up preventer line from the main. It was casing too many unexpected problems jamming and getting caught in places where it shouldn’t. In its place I added a 10 inch extension to the yard. So far no problems with the yard getting the yard end on the wrong side of the topping lifts. Plan to be home before the end of this month. Although I replaced my broken Red pine mainmast with a steel pole back in 2013, I have never been very satisfied with it. The 350 kg steel tube was within acceptable limits for the boat, not making it too tender (prone to excessive heeling) – but it had a few drawbacks. 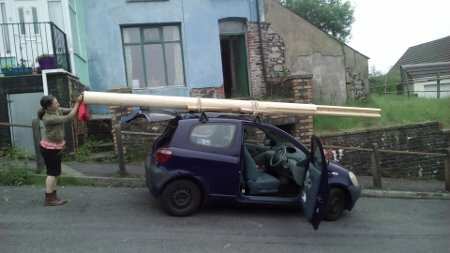 One drawback being its excessive diameter below, taking up too much living space (approx 9″ at the partners increasing to 10.5″ diameter at the step). Another drawback was its weight – reducing the amount of extra weight that would be reasonable to load on for long distance cruising. Then there was the nagging worry that so much steel wagging about in big seas would be too much strain on the structural integrity of the hull and deck. This may not have been a strictly rational concern – but it was an emotive one. And we sail to enjoy, not worry, right? 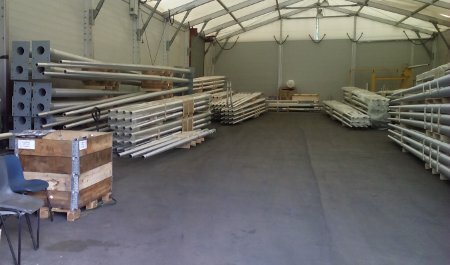 Another factor in prompting me to install new masts was the fact that I sourced a supplier of aluminium poles only an hours walk over the mountain from where I live. 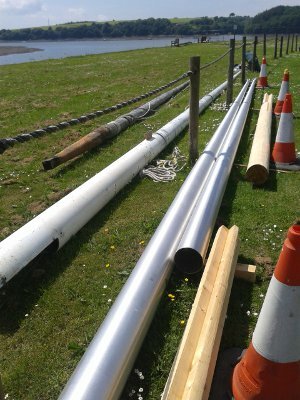 The company, ALC, import aluminium poles from the Netherlands mainly for street lighting uses but were willing to both source and do some custom welding on the poles for me before delivering them to Lawrenny Yacht Station – where the boat is currently moored. look at all those potential masts at ALC! 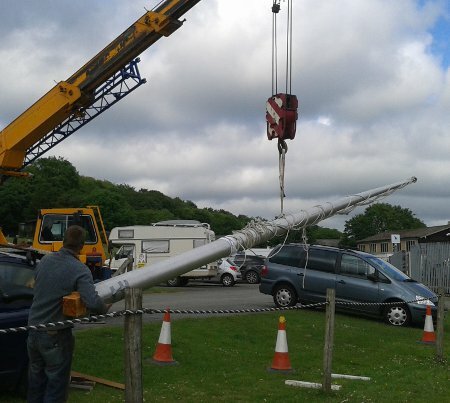 The main mast pole weighs in at 87kg with an 8 inch (199mm) diameter and a wall thickness of 3.5mm. You can view the blueprint for this pole here. What’s interesting about this pole is that the 8 inch diameter remains constant for the first 18 feet and only then tapers to 76mm at the top. This means that it provides significant strength and resistance when reefed down in heavy weather. It also has the benefit of not unnecessarily increasing in size between partner and step leaving it easier to accommodate down below. The same is true for the 6 inch diameter foremast pole. 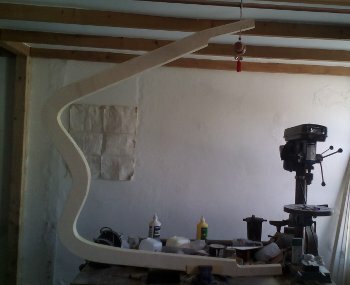 It only begins to taper after approximately 9 feet down to a top diameter of 76mm. Wall thickness 3mm. You can view the blueprint if the foremast pole here. For the masthead cranes I modified an idea forwarded to me via the Junk Rig Association forum. I fabricated two circular discs of 50mm thickness. The bottom plate had a hole cut out of the center approximately the size of the pole’s top diameter – to allow for wires to be passed up through. The top plate had a small hole just to let the navigation light wires (mainmast) and VHF cable (foremast) to exit. The two plates were then bolted together with stainless steel U-bolts from which the masthead lines and blocks were attached. 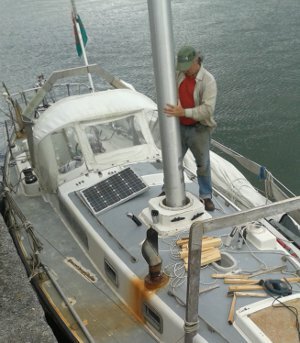 Having ordered these poles I was a little concerned that the bare poles by themselves may not provide sufficient strength in extreme conditions – conditions one has to face occasionally when sailing long distance. To assuage this worry I designed and built solid wooden plugs that could be inserted into the poles to extend well above the partners. The design is based on the fact that given enough force the place where standing masts will buckle (assuming no internal defect in the pole) is at the place of maximum resistance – at the partners where the mast exits the coach roof. The plugs themselves completely fill the lower internal cavity of the of the poles and then are increasingly reduced in bulk for a further few feet until it is only a 2 inch thick cross contacting the internal pole walls before coming to an end. The reduction in bulk is to allow a degree of bending of the plugs themselves and mitigate against buckling of the pole at the place of maximum resistance – which would be at the top of the wooden plug – if they remained solid and came to an abrupt stop some 8 feet above the partners. 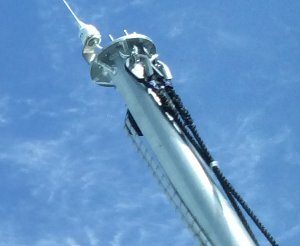 This design is meant to produce free-standing masts that are a reasonable in size and weight while ensuring sufficient strength and flexibility in the most demanding conditions. Should work ;). 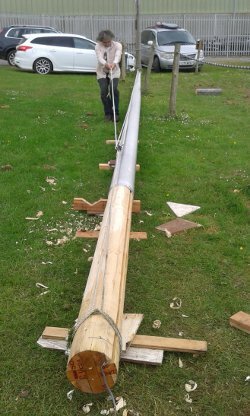 The mainmast now weighs approximately 300lbs (140kg) and the foremast 150lbs (70kg) – including weight of wooden plugs. A reduction of over 450lbs (200kg) of mast weight. The waterline has dropped an inch or more. The sails and rigging are now refitted with only a few remaining tasks to be completed before sailing off for the summer. 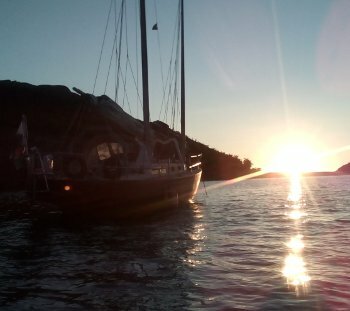 After sailing back to Lochinver from the Shetlands in July, we stayed put until the end of August when a high pressure locked in with brisk northerly winds. Like migrating birds we sailed south to Ireland for the winter. First landfall was on Tory Island of the north coast of Republican Ulster. After a night at anchor off the harbour pier we sailed down to Arranmore island on the NW coast of Donegal and anchored off the beach past the hook on the south coast. By this time the northerlies were starting to fade so the next day we made one last push south and by the next day, in light breezes, made our way into the “best natural harbour in Ireland”, Inisbofin. After waiting a week in Inisbofin for favourable winds we pushed off southwards again. Just south-west of Slyne Head the main yard suffered a catastrophic failure due to the de-lamination leading to it cracking in half. 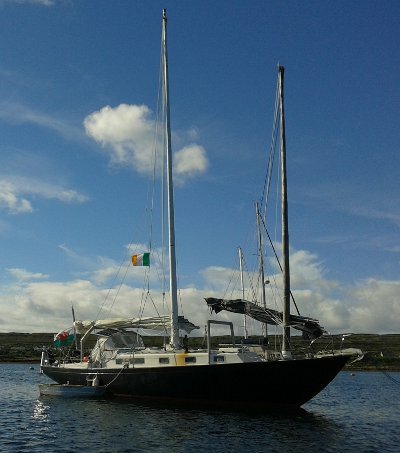 With no more working main we made the decision to head south-east to head to Kilronan harbour on Inishmore island in the Galway Bay. 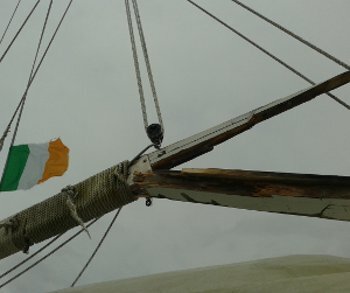 Within a few days we had repaired the main yard with a metal bar lashed to the break but the winds to sail out of Galway Bay and down the south-western corner of Eire were no longer in our favour. With no good forecast in the horizon we decided to take the ferry to Galway and the bus back home to Wales for rest. At this point Alison when up to Scotland for a writing course and within two weeks I was back in Kilronan with a good fair north-easterly breeze. The next few days I sailed around to Cork harbour stopping one night Glandore bay by Union Hall and the next night anchored of the beach just south of Courtmacsherry before heading into my winter mooring in Drake’s Pool upriver from Crosshaven. The sail from Glandore to Courtmacsherry was a particularly brisk one with 20+ knots from the south-west. 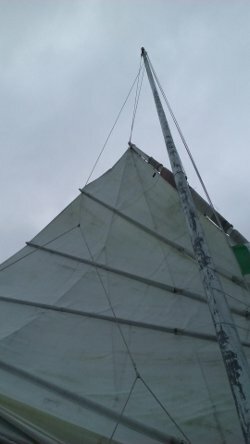 This made for a fast sail with a reefed main but as can happen in these conditions the main yard and top batten got caught up on the wrong side of the topping lift and mast lift due to a ‘fan up’ when gybing. This is not as dire as it may sound. 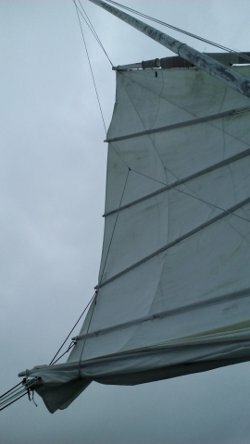 Even with a sail hung up on the topping lifts you can sail for many miles and directions without issue. To get the sail untangled you have to come to a stop tho and let the sail weathercock. At that time you have to go up on deck and get the yard and/or batten back into its rightful crib – usually accomplished by a long pole. Although not debilitating to the sailing ability of the boat, having your sail jammed after a fan up gybe is somewhat disconcerting and should be avoided if possible. 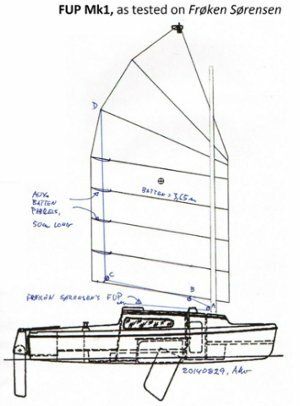 It was not until reading a article by Arne ‘cambered sails’ Kverneland (Stavenger, Norway) in October’s Junk Rig Association magazine that I fully grasped the dynamics that leads to fan ups and jammed yards and battens on the wrong side of the topping lift. 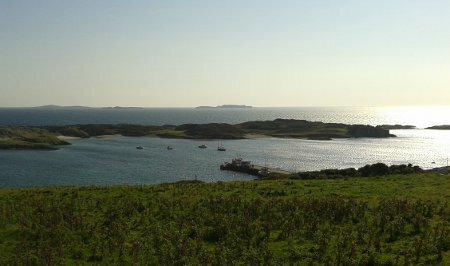 Having experienced two other fan up jams last summer, one from sailing back to Lochinver from Mull in 20+ knots and another when sailing down to Tory island in September, I was getting perturbed by the events and am now planning to incorporate Arne’s fan up preventer (FUP) line. Having brought both sails back home in December for repairs and strengthening, it is an ideal time to incorporate this preventer line. As much as I dislike adding too many running lines into the rig, this one extra seems worth it. 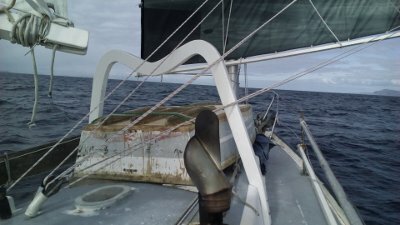 The solution lies in tightening up the fan up prevention line when reefed so the sail cannot ‘fan up’ without taking the entire sail bundle with it. This should prevent fan ups in everything but hurricane force winds. Or so I hope. I be able to report on its effectiveness when I go out sailing in stiff breezes this summer.